In the set we get one sheet (approx. 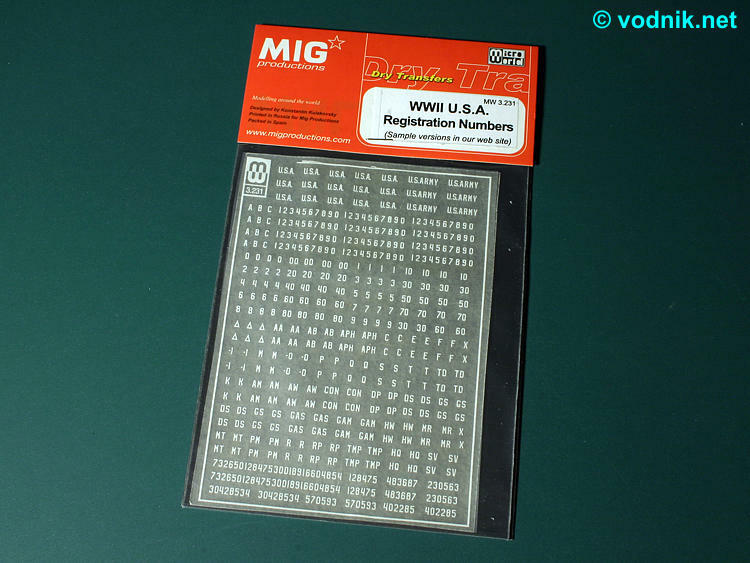 8.5mm x 11.5mm) of dry transfers of registration and bumper numbers for World War II US Army military vehicles. The sheet comes packed in a plastic zip-bad stapled to a cardboard "flap", with generic instructions of application of transfers on nine color photos (showing different transfer set though). There is no information given in instructions about the proper use of provided markings on vehicles, but there is a mention of sample applications being shown on MIG website (http://www.migproductions.com/transfer/examples/3231ins.htm - one a bit funny error in this document is the use of one Russian word in the middle of English text, but otherwise it is very useful to identify various codes used). On the sheet we get 25 lines of letters and numbers, all in one "non stencil" typeface and in one size (approx. 2.2mm high). 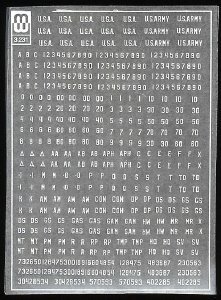 There is a lot of individual digits provided, plus some individual letters and various "pre-assembled" groups of letters, like "U.S.A", "U.S. Army" or "HQ", and digits, like "00", "20" and so on. 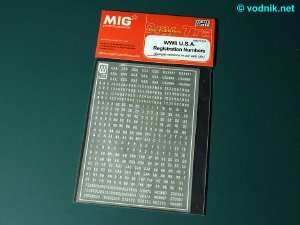 For ease of use there is also a few ready to use registration numbers given - groups of six or eight randomly assembled number, e.g. "483687". 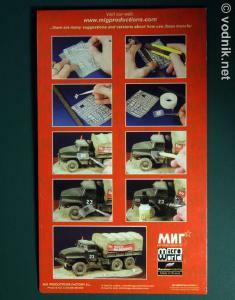 Included are also six outline triangles for armored division symbol. 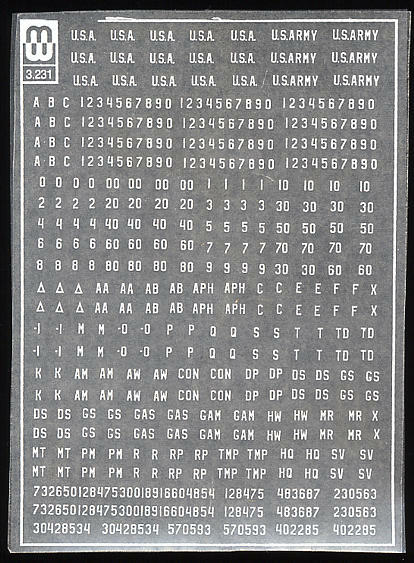 While the set is described as "WWII" it can actually be very useful for modelers building US armor from Korean and Vietnam conflict as well, particularly "U.S. ARMY" markings, which as far as I know were replaced earlier "U.S.A." only in mid 1950s. Click on picture to enlarge it. Click on picture to enlarge it. 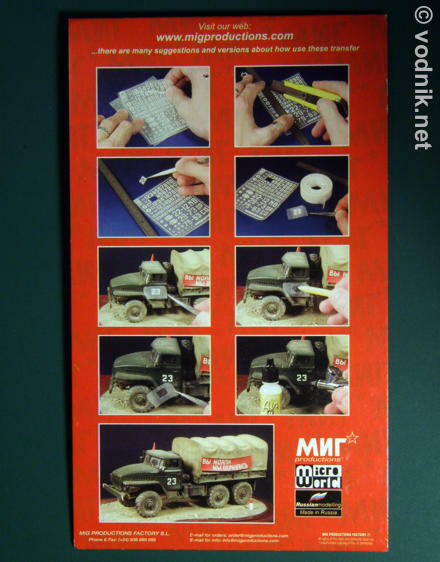 The MIG dry transfers set should be very useful for many US military vehicle modelers and markings applied using this technique usually look much better than standard decals.